I crossed the street and made my way between the concrete chess tables where the older Russian(?) men sit and play with stern faces and hardly a word exchanged. Seven Korean ladies and one man are stretching in the concrete field, jumping, twisting and dancing in place. The man stands aside as if too shy to join them but interested in being closer to their circle. I walk passed them and my path is crisscrossed by a young man with a black hat carrying his prayer bag. He is walking in a strange rhythm and is muttering some prayer – or words as he walks as if being chased by something imaginary. Just like every other morning – I walk out of the park onto Avenue P and see the stores are almost all open for business. The supermarket, Associated, is restocking for Passover which is in two weeks and there are boxes being stacked outside the store and being carried in by the workers. I cross East 4th, almost hit by a lady in a mini-van, who, despite the red light decides to pass the white line and turn onto the avenue with regard to the lights, people or action. Hopefully there is a camera capturing her doing so and she will receive an expensive photo in the mail. As I do each day – I walk pass the basketball court and the house next door to it, which I feel houses some woman of pleasure for a cost; but who am I to say? I don’t feel it should be illegal but this world is so tightly wound by the chest thumping bible preachers and their fear infused flocks that no one will come right out and say it. I see the block wide building with an Italian name and walk passed the strewn garbage blowing in this cold March morning. The trash seems to run in circles only to land in place back where it began. I walk pass the Dunkin’ Donuts and see the line of people and still don’t understand the appeal of their coffee or the donuts. Their coffee, to me, tastes like water with food coloring and their donuts, although delicious for the 20 seconds or so they last in your mouth – provide nothing of nutritional value and only make you feel regret once your stomach is stuck with it forever. I walk up the stairs as the F-Train to Manhattan arrives into the station and promptly departs. I know there is a train 4 minutes away so I don’t feel the need to run or be upset. I stop mid-way up the stairs feeling out of breath. Must be this wind. I feel kind as if I am watching myself standing there – a sort of out of body experience. I see myself on the platform, the wind is blowing stronger and I feel a bitter feeling in the pit of my stomach. “Did I eat anything?” No I didn’t. I drank a half a cup of coffee and that’s all. Maybe I am hungry? Whatever – the train arrives and I get on and head towards Manhattan. I wake up on West 4th, one stop before my stop and stand up to avoid sleeping into Queens. I get off on 14th, make my way through the crushing onslaught of people and find the stairs, walk down to the L train and take it one stop to 14th Street Union Square. As I walk up the stairs I feel a bit out of breath and finally make it to the street. I wake up on and I breathed a sigh of relief – it was all a dream. I opened my eyes – it was not all a dream. The tightening of my arm is from the blood pressure machine – I feel thirsty, a pole (its feels like one lined with sandpaper) is in my mouth and down my throat. I am thirsty. I am in pain and I am scared but somehow, calm. I see a nurse and I try and say the words, “Water.” No sound comes out but somehow she understands. “No water baby, I can give you some ice chips.” She comes back and I devour the ice chips as if they are ravioli. “I cant give you too much its not good, but here.” She mercifully continues to feed me ice chips which helps cool my desert like throat. I look up at the wall and see the time is 10 minutes to 3. In the daytime? Morning? I don’t really care – I ask for more gourmet ice chips and close my eyes to sleep. Another nurse comes in and she is pretty. I smile in my head that I still am impressed by a pretty girl – I am still me. I wake up and I find a red pillow in the shape of a heart. “If you need to cough put this against your chest, it will keep you from hurting more.” I take it and I fall asleep. Jessica took this lovely picture of me sleeping at 630 in the morning. I woke up and I saw Jessica – seeing her made me feel better than the ice chips – although I think the first thing I asked her was to get me some right away. She stayed with me while I fell asleep and I woke up to see Sammy and Saul standing there with my mother. I felt so bad for her because I know her too well – I knew she was scared and absorbing it all onto herself. It hurt me to see her there – I have a very strong bond with her and I knew she was crying inside. It made me nervous and I asked that everyone leave. 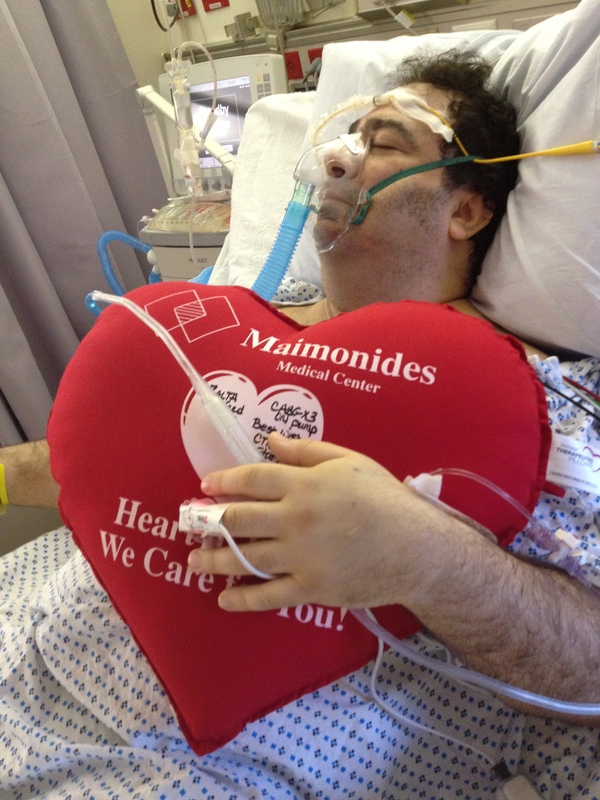 It was Shabbat and I was spending it at Maimonides Hospital cardiac ICU – under the name Alfred Zalta. 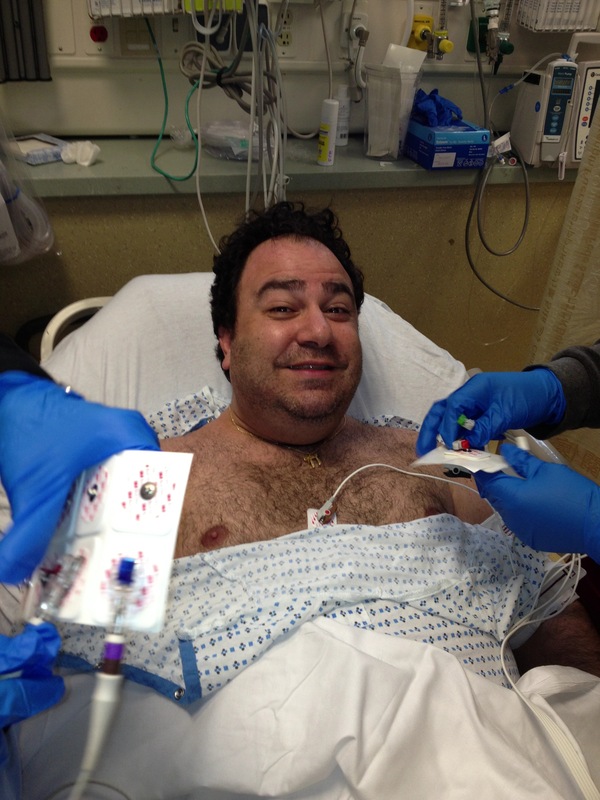 My nurse told me that from the moment I was brought there until her shift was over – she must have gotten 15 phone calls from my family asking how I was doing. “How was I doing?” I wondered to myself. I felt terrible and scared. I looked at my chest and it was scary. I was told to walk sit on a chair that Saturday – they didn’t want me laying down. I wanted to lay down. I sat up. They took that pole out of my mouth and I was able to drink water. I drank and I drank – my thirst never quenching but I drank and I drank. That Saturday, the day after the surgery, I was told to stand up and walk. I sat up on the bed, I was weak but I was prodded by my nurse who helped me stand up and walk around 10 feet or so and then back to the reclining chair that was right next to my bed. I wanted to sleep, I wanted to lay down and I wanted to drink a gallon of cold water. I sat down on the recliner and was given a pain killer. I fell asleep and woke to see my wife standing in the corner. I smiled and she smiled – walked over and kissed my forehead. At around seven or so I saw my kids walking in followed by Jessica and my mom. I smiled and tried to put on a brave face – well to be honest I don’t remember what I did – but I remember being thrilled to see them all together coming to see me. I was in pain, tired and extremely irritable – but when my eyes caught a glimpse of each of my children and then Jessica – a feeling of love swept through me and I was reminded just what it was that made my life worth fighting for. Sometimes we get so stressed and so lost in so many things that we do not have and cannot do we forget all the things we have been blessed with. I thought about how I was in the dark so many times in my life and was always blessed with a new day. After a long night of darkness the sun always rises and Jessica brought the sun back into my life. That Saturday night that was coming up would be one of the longest, most difficult nights that I would experience. Usually when I go through a long night when I cannot sleep for one reason or another – I always have in mind that no matter what happens, the time will pass and the sun will rise. That Saturday night, with the time change and the clock on the wall broken – I wasn’t so positive that the sun would rise. Which photo is before and which one is after? An outstanding share! I’ve just forwarded this onto a co-worker who was conducting a little homework on this. And he actually ordered me dinner due to the fact that I discovered it for him… lol. So allow me to reword this…. Thank YOU for the meal!! But yeah, thanx for spending time to discuss this topic here on your web page.